Portugal is a well-known quince variety, capable of producing large fruits with a very good flavour when grown in the right conditions. The fruit is ready for picking at the end of September, which is slightly earlier than most other quinces. However the fruits should be stored indoors (at room temperature) for a few weeks to ripen properly. Portugal quinces may turn a crimson pink when cooked (depending on how ripe they were). 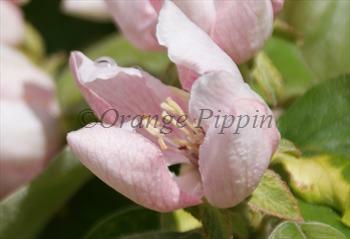 They have a soft texture and mild flavour which makes them particularly suitable for making quince marmalade. They are generally considered the best flavoured of all quinces. Please fill in the details below and we will let you know when Portugal quince trees are back in stock. One of the most vigorous quinces.? Portugal is in flowering group 2. Portugal is partially self-fertile, but fruiting will be improved if there is a compatible tree of a different variety nearby. 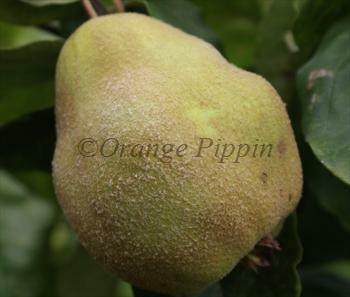 Although like all quinces Portugal is a fairly hardy tree, it needs a sheltered location to produce good quality ripe fruit. It prefers a dry climate and is not suitable for the wetter north-west of the UK - it is probably the most challenging quince variety to grow. Whereas many quince trees have an attractive growth habit, Portugal is not the best choice for a feature tree - it is grown just for the fruit. It works well as a fan-trained tree or just simply allowed to grow up a south-facing brick wall. Portugal is only partially self-fertile and cropping will be improved if there is a compatible pollinator nearby such as Meech's Prolific or Serbian Gold. Unknown origins but introduced to England in the early 17th century.